Black Box said the app supports multiple simultaneous connections with up to 45 fps full HD video. The app is for tasks such as remote process and applications monitoring. 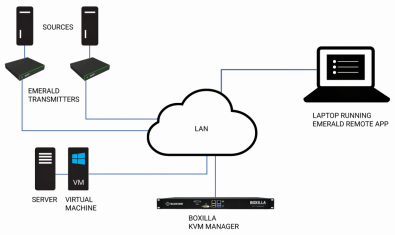 With authentication against the Boxilla KVM network manager, the Remote App offers users a list of connections and provides access just as a standard hardware-based system. However, because the Remote App is not tethered to a fixed location, users can access the Emerald KVM network from anywhere using their own computer or laptop. The Remote App is maintained through regular updates. The Black Box software is free to download and is licensed on a per-connection basis. Black Box plans to release the product this summer, making it available at the company's web site.